Is there a site to buy the first book in ebook format for the kindle for the U.S.? I cannot find it and Amazon only has paper copies. Thanks for your message, Brandon. http://www.amazon.com/Keeping-Real-Quantum-Gravity-Book-ebook/dp/B004BDOJXG/ref=sr_1_4?s=books&ie=UTF8&qid=1438263999&sr=1-4&keywords=kindle+books+justina+robson Here is a link to amazon.com but you can buy it from other retailers too! Hope you like it. Thanks for the link. Amazon shows this as ‘this title is not active’ — ??? and, it is not displayed on your author page when it’s limited to Kindle Editions. I wanted to pick up a copy on amazon.com this morning, but the kindle version still isn’t available. I can’t find it on Amazon or Barnes and Noble yet. Has your publisher had any luck sleuthing out the problem? Yes, I see what you mean now. I had looked before and assumed it was fixed but I didn’t click through on the Kindle edition – and when you do there isn’t one, it sends you to the UK site. I need to contact PYR US and find out if they plan to do anything with the ebook rights. So sorry I have not realised this before. Thank you for your prompt. Any luck with Pyr US? I wanted to leave you a message about something I think that you may want to look into. If you get a chance you may want to research the new ghost in the shell movie and compare it to your novels. I say this because I noticed that it deviates strongly from its original plot, & instead seems to incorporate many of your novels intellectual ideas. Thanks for the tip. I still haven’t seen the movie but I plan to. When I was writing QG I saw marketing for Ghost in the Shell the original anime series but I never watched it because I was worried I’d feel like I’d missed the boat. Just to touch upon Sophia’s comment RE: The Manga Ghost in the Shell, that series started life in 1989 written by Masamune Shirow he has written other Manga series which are also very advanced [Check out Appleseed, also superb] so, therefore the movie is really based on the main character as it was written in 1989 and all through the whole series to date which are many Major Motoko Kusanagi of Section 9. There must be some 20 DVD’s + in the series and to many to count Manga comics, no doubt. Thank you very much, Dr. Adam. I will try to write more stories there one day soon. Meanwhile I look forward to seeing the film. By the time you read this I’m sure I’ll have sent an email to your agent John Berlyne. But If not I just want to say I love your series Quantum Gravity, they got me through my time in the United States Air Force where I served six years. And now I have been out for a whole year studying to become an actresss. The Character Lila Black resonated with me so much that I have the desire to ask your permission to write and make a screen play off this character and the worlds you have created. And I hope to make that a reality with your guidance and permission. Thank you so much for your comment and letter. I’m delighted you liked the books. I hope my agent has replied on this issue by now, do let me know if not. I’m also interested in Keeping it Real in ebook format. I tried your link on Amazon and it’s still not listing it here in the US. Also no joy on Barnes and Nobles. 🙁 Interestingly, the other books in the series are listed. Any update? Am I able to access it from the UK store? I am perplexed by this. You should be able to see it on the UK store and buy it there. Let me know if you can’t. I will look into the US book issue. I am slow at this however, so be patient if you would. 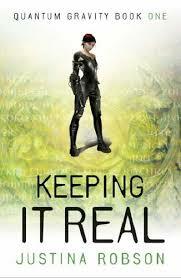 Just wanted to let you know that I contacted Pyr, about the e-book for Keeping it Real not being available in the US (even though all the other books have a e-book version) they said that the Keeping it Real e-book edition is out of print. Not sure how that makes sense, but I would like to read your Quantum Gravity books but only use my e-reader. Thought I’d let you know what I found out. Thank you for sending this and sorry I am so slow in replying. Is it possible for you to buy the books on the UK sites or not? I know that they definitely exist. Customers with US addresses can’t get ebooks on the UK site, unfortunately. Thank you for letting me know. I am pushing for rights reversion on the series with US publisher now so we will see what happens.